Nestled into a scenic valley in the Northwest corner of Massachusetts – with views of the Taconic Range in New York, the Green Mountains in Vermont, and the Berkshires in Massachusetts – Caretaker Farm has been a welcoming home for the community for many years. The 35 acres of land are a woven fabric of cropland, pastures, ponds, woodland, a stream, and agricultural buildings. We use sustainable methods of farming to ensure that the land will continue to be restored and improved for future generations. There are over 175 varieties of 40 different crops grown each season. Instead of chemical fertilizers, compost created from our animals and vegetable matter is used to build up the fertility, structure, and tilth of the soil. A portion of the cropland is taken out of vegetable production each year in order to let it rest. Various cover crops and mulches are used to reduce weed and pest pressure, increase the ability of the soil to retain moisture, reduce erosion, and build the soil. For pest control we rely on floating row covers (a white, polyester fabric that acts a physical barrier to pests), crop rotation, and sometimes removing pests by hand. We do not use chemical herbicides, pesticides or insecticides including those that are allowable under the USDA organic standards. There are hundreds of families walking our land and eating produce directly from the fields each week and we feel it is important that all of us feel comfortable being nourished by vegetables that have been grown. 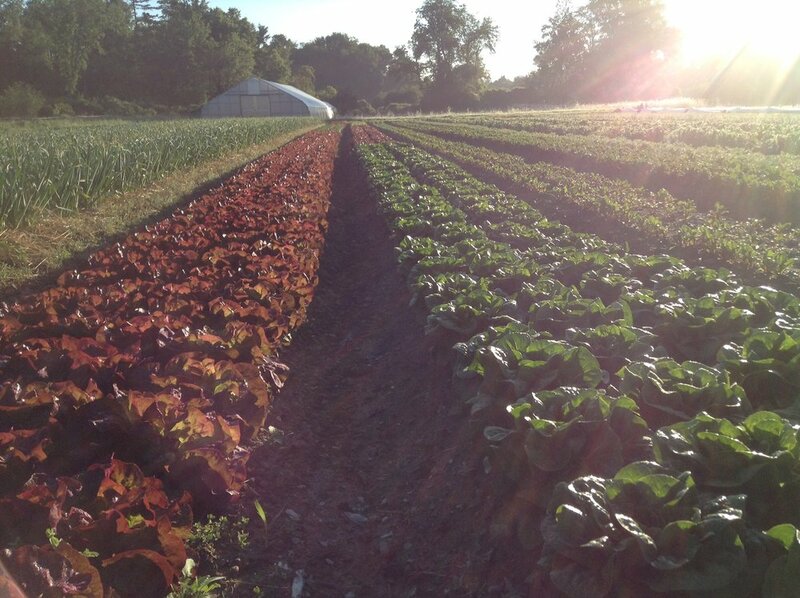 Our farm is like your backyard garden…only a little bigger. Our farm animals play an integral role in the overall farm organism. We currently have about 90 chickens, 4 pigs and three bee colonies. They create tons (literally) of incredible compost that we spread on the land and use in our greenhouse soil mix; they turn our compost, give a natural rhythm to the farm, educate apprentices and members of the farm through our care of them, share companionship with us, and help rejuvenate our pastures. Our animals also provide our members with a local source of meat and eggs that are humanely raised without growth hormones or unnecessary antibiotics. There are two ponds on the farm and a stream bisects the land. Woodlands are interspersed with the fields and there is even a vernal pool. Wildlife abounds in this environment and each day seems to bring new birds, mammals, and insects. We strive to work in accordance with the natural world as we move towards our agricultural goals. On a tour of the farm you will notice various alternative energy projects. Our farm is powered by a 9.9 KW photo voltaic system. These panels provide 100% of the electricity for both the farm and our home. Additionally, the portable electric chicken fences used in the fields and pastures are powered by solar panels. As an added benefit to being a farm member, we are so thankful to have a bakery on the land to provide a diversity of products available each distribution. Jenna Fenander has been our extraordinary baker for over 14 years. We have a mill in our homestead bakery that she uses to grind organic wheat berries into flour. For most distributions each week (Tuesdays, Fridays and Saturdays) she creates over 7 different types of bread, cookies, scones, pies and other goodies. All baked goods are for sale within the distribution area.